Family members in New Jersey, high school friends in Los Angeles, complete strangers in Chicago—I’ve seen their faces, befuddled by the sound of the four-letter-word on my driver’s license. “What’s it like?” they ask, even though it’s generally understood that no one really cares what Ohio’s like, only how it will swing in the next election. The only thing worse is when someone makes a snide comment about the state. Then, I have to think on my feet, and list all the reasons to love the Buckeye State. “Ohio’s got great bike trails … oh it’s not that cold, the weather is no worse than Connecticut … for the price of a one-bedroom in the Village I can buy a couple mansions … we’ve got the Rock N’ Roll Hall of Fame and the Pro Football Hall of Fame.” Such boosterism, however, tends to be greeted with a slight smile and a quick change in conversation. I suppose my salesmanship is less than believable, especially since I can barely believe it myself. Ohio may be shaped like a heart, but my heart really isn’t in it. Not that living here isn’t pleasant. I’ve enjoyed hiking across the ledges at Cuyahoga Valley National Park, ambling across the rocky coast of Lake Erie at Put-In-Bay, and window shopped among the galleries of Columbus’ trendy Short-North. Ohio seems to have a little bit of everything: three culturally rich cities, some swell universities, shore-side vistas on Lake Erie, rolling, wooded hills, and picturesque farms worthy of a Wyeth painting. But, despite such subtle pleasures, Ohio is a state cloaked in anonymity. It’s a photo album of Americana without a memorable picture. The places I’ve lived before all have something iconic about them: New Orleans’ smoky jazz clubs, New York City’s skyscrapers and pizza, Southern California’s movie stars, and even New Jersey’s “real” housewives (and of course its shore). But Ohio is beyond the realm of imagery. Perhaps that’s why it has failed to attract the imagination of our nation. 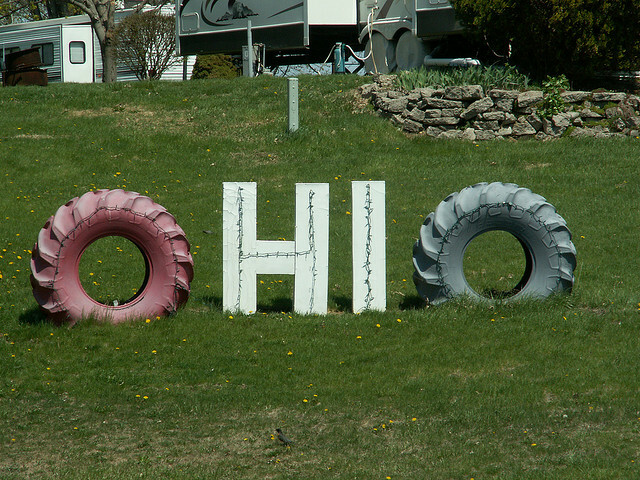 When we do think of Ohio, we think of it as a place to be from. We’re called the “Birthplace of Aviation” because the Wright brothers are from Dayton, but their flight took off in North Carolina. Sherwood Anderson wrote Winesburg, Ohio from a desk in Chicago. And Doris Day, Clark Gable, and Paul Newman only became household names after they hit it big in Hollywood. The one popular TV show set here, Glee, stars a bunch of kids who sing about how eager they are to leave Ohio and follow their path to stardom. I’ve found, too, that Ohio is not an easy climate for dreamers; I can understand why many of the brightest and most talented natives leave once they get the chance. It’s a state bound by convention—and it may very well be the most average state in America. It’s not flat, but not quite mountainous either. The climate is temperate: hot summers, cold winters, a mix of rain and sun. Our cities have world-class institutions (Cleveland’s Orchestra, Columbus’ Zoo, Cincinnati’s chili), but are not that worldly. Surrounded by Pennsylvania, West Virginia, Kentucky, and Indiana, the state manages to be East Coast, Southern, and Midwestern at the same time, while lacking any real sense of regionalism at all. No one has a distinct accent, and the food is never that spicy. Even its exports are pretty average. Ohio makes the parts in your car, the Tide in your washing machine, the Smuckers on your toast, the Abercrombie shirts you wear. But all this average also adds up to a pretty good barometer for the rest of the country. Ohio’s politics are national politics, and every four years its electoral college becomes the deciding factor in choosing the next president. Just like our country, Ohio can’t seem to decide if it’s better to be a liberal Republican or a conservative Democrat. I, for one, am neither, and have found myself to be quite the outlier in this semi-Midwestern state. I live in Ohio, have an Ohio license plate, pay Ohio taxes, and probably even qualify as an Ohio resident. But even as I’ve resisted becoming an Ohioan, there’s something eerily, comfortably familiar about this state. I can find Ohio anywhere in the country, in small towns with picket fences, among smokestacks of industry, along local highways lined with stores, or at a county fair. Ohio, for me, is a state of mind. It’s about putting some of your fantasies aside and being practical. It’s the feeling that you need to settle down, be close to family, further your education, and find a “real” job. At least that’s why I’m here. Moving to Ohio for graduate school is the most adult thing I have done in my life thus far, and mentally allowing myself to become a part of it is terrifying. I can feel the fear when I’m buying pork chops on sale at the Giant Eagle, trying to mow my lawn on a Sunday afternoon with a beer in hand, and when I’m watching a marathon of House Hunters on HGTV. How can I hold on to the California in my life, when really, underneath it all, we’re just a bunch of Ohios? Craig Libman is a doctoral student in counseling psychology at the University of Akron. He lives in Ohio. *Photo courtesy of Cindy Funk.